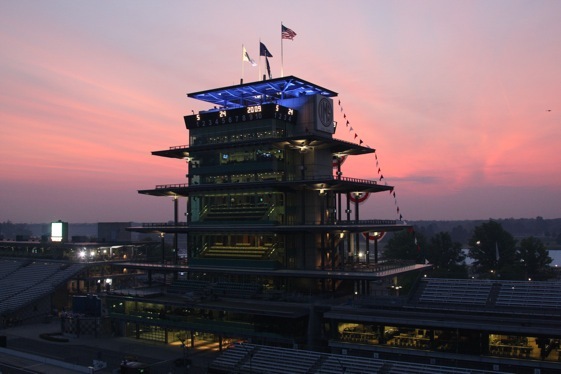 Indianapolis – The first book I checked out of the public library in my hometown was a history of the Indianapolis 500. And one of these days, I’m going to bring it back. Actually, I’m sure that book was returned to the Jervis Public Library in Rome, N.Y., shortly after I devoured every word and photo. And if it wasn’t … the statute of limitations surely must have expired some 47 years later. The first driver I can remember connecting with Indy is Rodger Ward, the race-winner in 1959 and 1962 and runnerup in 1960. Some guy from Texas named A.J. Foyt Jr. got my attention with victories in 1961 and 1964. For some reason, Parnelli Jones’ victory in 1963 made such an impression that I bought and built a small model replica of “Old Calhoun,” the No. 98 Agajanian Willard Battery Special. But the real stars of the 1963 race for me were Formula One hero Jim Clark of Scotland and American Dan Gurney, who “invaded” the Indianapolis Motor Speedway with Colin Chapman’s rear-engine Lotus/Ford. All the attention generated by the Lotus and Clark and Gurney got me permanently hooked on the Indy 500. ABC began its current 45-year run of Indy 500 coverage with a highlighted version of Clark’s dominating victory on “Wide World of Sports” in 1965. But I recall listening to that race on a Philco transistor radio, propped up on the windowsill of my bedroom, on a rainy Memorial Day Monday in Central New York. That said, here are my top-five memories from 30 years of Indy 500 coverage. 1980 Johnny Rutherford’s third victory: Nothing can top your first visit to the Indianapolis Motor Speedway, even if you’re on the proverbial clock. Rutherford was the pole-sitter and center of attention all month in Jim Hall’s Pennzoil Chaparral – The Yellow Submarine – the car that brought ground effects technology to the Speedway. The Texas connection between Fort Worth’s Rutherford and Midland’s Hall made for a natural story angle…once I got over the awe of actually being at Indy. I made plenty of rookie mistakes, including wearing a sports jacket on race day to the old cinderblock Media Center, which was cramped and smoke-filled and not very well air-conditioned. And when the race was over, I initially went to the wrong press room for the winner’s news conference…another protocol learned. 1985 Danny Sullivan spins and wins: Sullivan was attempting to take the lead from Mario Andretti on Lap 120 when the rear end of his car slid out exiting Turn 1. Sullivan spun one-and-a-quarter times across the south “short chute” as Andretti dove to the inside to avert a wreck. Sullivan avoided any contact with the wall, recovered and headed to the pits for a tire change. Amazingly, the tires were not even flat-spotted. Twenty laps later, Sullivan successfully passed Andretti – in the same spot –en route to an improbable victory. It was a great story…except for the fact I never got to write it. I was to the point of wrapping up my story when the writer seated next to me reached over to pull the chord for his computer out of the socket. In so doing, he also disengaged my “Portabubble,” scrambling the unit’s brain and sending my story into cyber oblivion. Monday’s Sports section of the Star-Telegram carried an Indy 500 story bylined by Gary Long of the Miami Herald. 1986 Bobby Rahal wins it for Jim Trueman: It took two weekends to complete the 70th edition of the race, which was run on Saturday, May 31, 1986. Rain washed-out the originally scheduled date on Sunday, May 25, and Monday. So one week later, everyone was anxious to get the race in and done. As the race wound down, Kevin Cogan was in the lead under caution after passing Rick Mears and Rahal. When the green flag flew for the restart, only two laps remained. Rahal beat Cogan into Turn 1 on the restart, with Mears in third. That’s the way they finished, separated by only 1.27 seconds in the closest 1-2-3 finish ever. The emotional undercurrent of Rahal’s win then became very public. Jim Trueman, Rahal’s longtime car-owner and confidant, was very weak from a lengthy battle with cancer. Trueman, who watched the entire race from his pit box, was escorted into the post-race interview room by Rahal. Wearing a cap that also covered his ears to protect him from the sun, Trueman’s voice was weak when he answered a few questions. When the session was over, Rahal took Trueman by the arm and began to walk him down the narrow aisle out of the room. I still remember the clattering of the metal folding chairs as the assembled media stood in unison, in silence. And there wasn’t a dry eye in the place. Jim Trueman died 11 days later. 2006 Sam Hornish Jr. nips Marco Andretti: Returning from retirement to race against son Marco, Michael Andretti was in the lead on a restart at Lap 196. Mikey is four laps away from his elusive first Indy 500 victory. But just over one lap later, Mikey was passed by 19-year-old rookie Marco on the outside going into Turn 1. Marco held the lead through Turn 4 of the final lap…but with Sam Hornish Jr. closing fast. Hornish, who never had placed in the top 10 in six previous Indy 500 starts, drew along the inside of Marco down the frontstretch and slingshotted to victory by 0.0635 seconds. It was the second-closest finish ever, with Michael Andretti third. Incredibly, Michael raised his career laps-led total to 430 – four more than Rick Mears compiled en route to his four Indy 500 victories. And Marco showed the mettle of a future 500 champion. Nice piece of writing, thanks for that. Having had my own library card revoked long ago, I’m left with video highlights to rekindle my Indy memories…and it doesn’t matter how many times I see it, I always wonder whether Gordon Johncock will be able to hold off Rick Mears or not.